You love your family and your hometown team. Show your love for both of them with customizable baseball and sports decor from PersonalizedThings by Exposures! 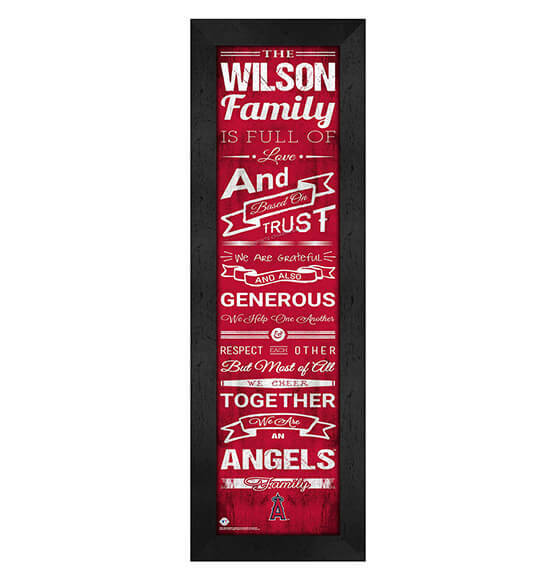 Our Personalized Family Cheer Los Angeles Angels MLB Family Wall Art celebrates your passions for both parts of your life. With a high-quality paper protected behind glass and an MDF vinyl-wrapped frame, this vertical hanging art features the Los Angeles Angels' logo and team colors. It also features sweetly sentimental, heartwarming sayings about family that are family-room worthy. This easy-to-hang sports decor includes a vintage-inspired design and sawtooth hanger for quick decorating.